We all know the default size of ping ICMP echo request packet. That is 32 byte. Though the default ping packet size is 32 bytes, we can change it by a simple command while pinging a destination from your computer. By using -l option, you can decide the size of the echo request packets. The valid value of the size of ICMP packets is from 0 to 65500. So the size of the packet should fall in the range. If you set any value, not in the range of 0-65500, you will get an error with warning bad value for -l, the value range is from 0 to 65500. If you are facing issues with an MTU value of ICMP packets sent from your computer, changing their size may help you. Let us check how to change the default packet size of ping echo request. You need to use the command format provided below. Here let us check how to use this command to change the default size of ICMP echo request packets. I am going to send packets to a destination address with manually configured value. Here I use different values, and you can see the result on the screenshot provided below. Here I have changed the default value of 32 with 50. Let us check how this command changes the size of echo packets send from your computer. 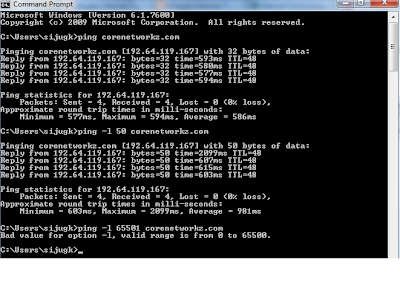 The above picture shows ping packets send with different sizes. So I believe you have learned the procedure to assign any size for the ICMP request packets sent from your computer. Likewise, if you want to change the default number of Echo requests send from your computer, you can do it by following the instructions provided in the link below. Not just the default size of the Ping requests but the TTL value too can be changed from your computer. How to Set Chrome Auto Resume Failed File Download Feature? How to Setup Idea 4G On Android Phone? If you want to change the default TTL value of the ICMP requests send from your computer like you have changed the default size, click on the link below. Sometimes ping packets send from your computer with different packet sizes may bring you certain error messages instead of a proper reply from the destination. Most of the time it might be related to some other issues. The link provided below shows such an error.